Advanced Document Systems & Supply Inc carries the GBC ProClick® Binding machine, a new innovative binding solution from GBC that will surely make your reports stand out from the crowd. 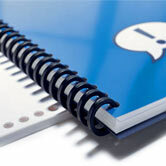 ProClick is an innovative, fast, easy binding style. ProClick lets pages lie flat with 360° rotation for convenient access to the pages, and it lets you easily add and remove sheets using ProClick Spines. These spines are ease to snap close and zip open, allowing for easy editing and immediate modifications to your presentation or documents. ADSS.net is proud to feature the ProClick P210E Guide Right™ machine. 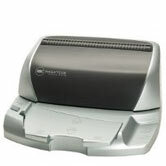 The GBC ProClick P210E system is an excellent choice for medium-size to large offices with weekly binding requirements. The new Guide Right paper alignment system with front and side guides ensures accurate punching every time with a simple push of a button. The machine punches up to 15 sheets of paper, and can bind up to 110 pages quickly and efficiently. Results are perfect every time. Your presentations bound with the GBC ProClick machine and GBC ProClick spines are easily customized and edited. GBC Proclick spines are compatible with any WireBind binding system. Although this is a plastic element, it is not to be confused with plastic coil binding. For an exact fit, measure your finished document and use the sizes listed under document thickness in the Proclick Spines comparison table provided. Remember to include your covers when measuring. Browse our selection of ProClick spines, and our extensive catalog of Coil Binding Machines, Wire Binding Machines and Binding Supplies. We guarantee that you won't be disappointed. The P210E Electric Proclick binding machine achieves perfect results every time with its exclusive Guide Right™ feature. New front and side guides ensure paper is aligned before one touch electric punching.